Synopsis: "For those who have courage…for those who do not fear death…open this book and turn the page!” goes the magazine in which this manhwa is serialized in. And for good reason. 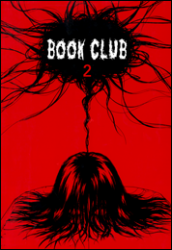 Peek into the horror within this particular book club. The president Kyungdo is a crazy maniac about books and while Eunsae tries to protect him from them, he is just so crazy about them. His fate in fact is connected to the legendary library of Alexandria, the greatest library that was ever destroyed, and Truman Capote’s In Cold Blood.